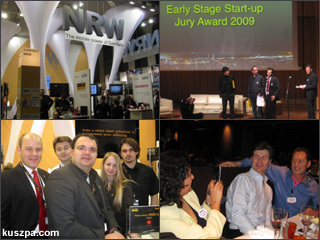 Our MWC team (Max, me, Marcus, Sandra and Matthias), our booth, MoMo Peer Awards and MoMo Dinner (Bena, Jakob and David). The first day at the Mobile World Congress in Barcelona was quite busy, but luckily I had a motivated team with me and the booth organisation was great, so I could relaxative focus on my business meetings. Amongst others I also had a chat with Ben Tatton-Brown and Harry Dewhirst from ringringmedia.com. It was great to see the guys, who some months ago worked for an old combatant called pitch.tv, but now started a new own business in the mobile advertisement field. Later on I had luck, because I could join the winner’s table at the Mobile Monday Peer Award Dinner and have dinner with Jakob Berg (PopCatcher AB) and Per Ek (PopCatcher AB). It was a funny evening at our table and I also had very interesting talks not only about mobile with the other people in the round; Bena Roberts (visibility mobile), Christine Perey (Perey Research), Ezequiel Ardigó (a2dm) and David J. Blumberg (Blumberg Capital). Some more notes about the Mobile Monday Peer Award Winners by Matthäus Krzykowski and some more pictures from the Mobile Monday Peer Awards.